Bad Times at the El Royale Review: One of the smartest thrillers to come along in quite a while – AiPT! Bad Times at the El Royale puts a smart script and talented actors to great use. Anyone who knows me knows that I love a good thriller. Unfortunately, a lot of the thrillers that get made turn out to be pretty generic and run of the mill. Every once in a while one comes along that takes a different approach. Bad Times at the El Royale is one of the different ones. I think the best way to explain the feeling I had while watching this film is: a breath of fresh air. It’s so nice to see a film that takes the time to give such depth to each character and moves along at a pace that keeps you interested and guessing. So what exactly is the story behind this hotel and all it’s inhabitants? The story surrounds a hotel that was built on the border between California and Nevada. Four strangers end up arriving at this hotel at the same time, each of them complete strangers to one another. Certain things end up happening soon after they all check-in and… I have to leave it at that, since I don’t believe in spoilers. I will say that this film tells it’s multi-faceted story in an interesting way, a way that engages the audience. I’ll break down what exactly it does to engage the audience and why I think this thriller is so damn smart. The very first thing I want to cover is the cast and the performances they give. I loved the casting here; one because they very much fit the roles they played and two because each actor is obviously very talented and gives it their all. Jeff Bridges was fabulous–a very meaty interesting role for him–and it’s a performance that’s a lot of fun to watch. Cynthia Erivo is fantastic. She’s for sure the breakout star here and really commits to the role of Darlene. Dakota Johnson, who was in dire need to break out of the Fifty Shades mess, was really good and I’m glad she was because she really did need something great after the abysmal Fifty Shades Freed. Chris Hemsworth gives what I personally think is his most interesting performance yet, and probably his best yet. Jon Hamm is good, his role is a lesser one, but he does make the most out of what screen time he does have. And last but certainly not least is Lewis Pullman, who I was impressed with. His character ends up being more important than I thought he would be, and he handles it all very well. The writing is also extremely well done. The script gives each character a proper backstory that provides depth. I think the specific backstories are all interesting and well explained, especially Hemsworth’s and Johnson’s. The dialogue is very good too, I found myself so impressed with some of the exchanges between the characters. Erivo’s character is given very intelligent lines to work with. That’s so important in any film, not just thrillers. I want to hear dialogue that keeps my ears perked, and interested. There’s one exchange in particular between Erivo and Hemsworth that is so great, you’ll know it when you hear it. The soundtrack, Erivo’s singing in particular, is very skillful and beautiful to listen to. The visuals are also spot on and very striking. Also, I loved the ending, very good note to end on. Overall, I was very impressed with this film. It’s well written, keeps the viewer interested up till the very end, and has great performances given from each cast member. Jeff Bridges said that he chose this project because the script “popped”, and I have to say that Mr. Bridges is 100% correct. 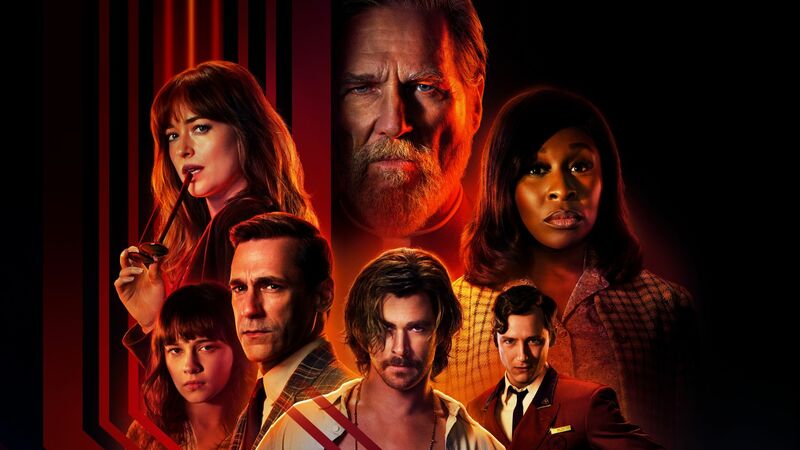 Bad Times at the El Royale puts a smart script and talented actors to great use, making it one of the best thrillers I've seen in while.